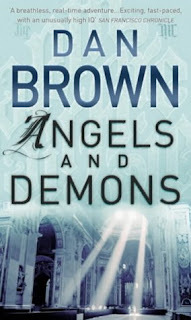 A phone call rudely awakens university professor Robert Langdon. Not answering but uncapable of going back to sleep, he wakes up for breakfast. At that time he gets a fax portraying the dead body of a scientist working for a company called CERN, which dedicates itself to scientific discoveries. The fax asks him to come to CERN to help rocognize the symbol carved into the dead body. Appearing at CERN, talking to head of the organization Max Kohler, and examining the dead body, he discovers that the scientist was murdered by a group called the Illuminati. The question is how did the Illuminati appear after being dead for so long and why did they kill this specific scientist among millions. This leads to Robert Langdon, a religious symbologist, and Vittoria Vetra, the murdered scientist's daughter, on a quest around Rome to help fight the war between religion and science. This story is very good. It has quite a few sudden turms, and at the end the entire story changes. It is suited for people who like adventure and can handle graphic deaths and tortures. For some reason I read the first page of the story and just gave up. Don't ask me why... I guess I was just really bored...?